Don’t land me in one of those relationships where we’re always pecking at each other, disguising insults as jokes, rolling our eyes and “playfully” scrapping in front of our friends, hoping to lure them to our side of an argument they could not care less about. Those awful if only relationships: This marriage would be great if only … and you sense the if only list is a lot longer than either of them realizes. Flynn, Gillian (2012-06-05). Gone Girl: A Novel (p. 29). Crown Publishing Group. Kindle Edition. Have we all not been the uncomfortable witness to this scene before? While on vacation I came across this couple where they professed undying love and showed constant annoyance while just kidding. They sighed and bickered at each other each time they engaged in conversation, they sparred skillfully since it was nothing new to them, stabbing each other verbally, extracting the sword as if it was par for the course and laugh it off. I sat and wondered if people realize how hard that is to watch? Do they know how uncomfortable it is for us who don’t want to play this game with them? If this is their public image, how absolutely awful must their private life be? 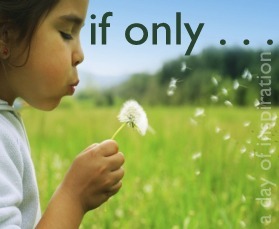 One day the person wishing their If Only Relationship was something more will find their If Only Relationship is gone. Then the cry will be If Only they were here. I am a firm believer that God will teach us daily lessons if we’ll pay attention and today my lesson was learned. Be grateful and kind to your spouse. Learn to forgive and let things go because if you don’t, you’ll end up like those two, trying to say what your heart is bitter about through public insults. I have to go and kiss my husband’s forehead and tell him that he is my ONLY and there is no IF about it. I accept him as he is!